Since I have quite a backlog of things I want to blog about1, I decided to combine a bunch of things into one blog posting. You may recall that one of my 2018 goals is to learn 12 new things, but thus far I’ve only written about one of them. But that doesn’t mean I haven’t been learning new things – I’ve been learning lots and lots of things! Here is a quick summary of 3 of them. I have mentioned this previously, in my very long posting about my trip to Hawaii, but I wanted to officially count it in my list of things that I learned this year! The most important things that I learned about surfing were that it’s really important to paddle like hell once you see the wave you want to go for to get up enough speed that when you jump up, your board is going fast enough, that you jump up at just the right time (too late or too soon and you are going to go for a swim! ), and that jumping up to standing actually isn’t that hard. Same goes for snorkeling, Prior to my trip to Hawaii, I’d never snorkeled before. Turns out, snorkeling is pretty easy (made even easier by the fact that we bought snorkels that have a value that prevents you from breathing in water when you dive down so that your snorkel is below the surface), but it’s still something that I learned. Last year I took a couple of sewing classes, making a tote bag and some fabric buckets. 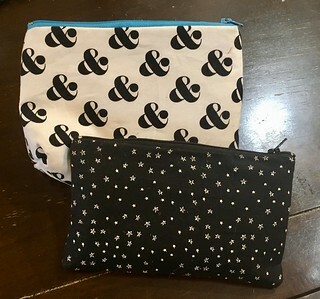 This year, my friends and I decided to kick it up a notch and sew zipper pouches – which meant we had to learn how to sew a zipper! I made them with the leftover fabric from my tote bag, which is cool because (a) they match my tote bags, and (b) I managed to not lose the leftover fabric from my tote bag, which I made nearly a year before!